Vipassana meditation also called insight meditation is a basic approach used by diverse traditions. 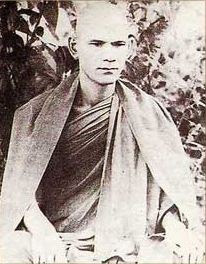 Mahasi Sayadaw, died in 1982, was a Burmese Theravada Buddhist monk and meditation master who had a significant impact on the teaching of Vipassana meditation in the West and throughout Asia. In his style of practice, the meditator anchors their attention on the sensations of the rising and falling of the abdomen during breathing, paying attention to sensations or thoughts.